It has been noted (at great length) in T44138 that the "Publish changes" button that's shown when editing is slightly unclear and can be misleading since pressing it opens the dialogue to add an edit summary rather than immediately publishing changes. An ellipsis should be added to that button to indicate that it is not the final step. This solution is not perfect, and it does not fully resolve the problem described in T44138, but it is a small step in the right direction. This ellipsis will not be added to the edit summary dialogue, since that is the final step. NB there are four messages for this button: [Save|Publish] [page|changes]. 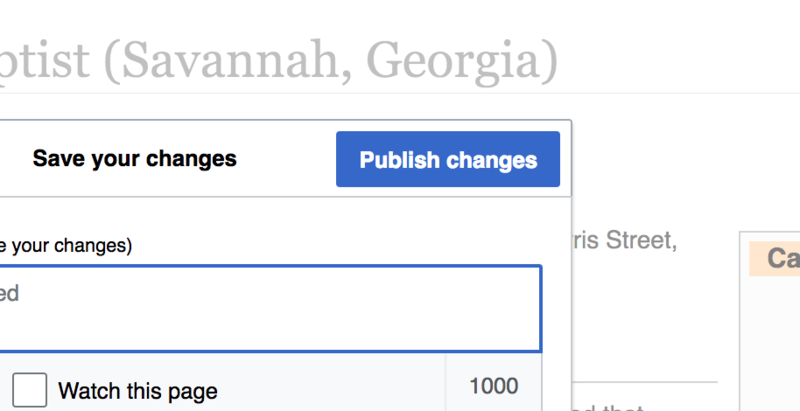 Save vs publish is for private vs public wikis, and page vs changes is for new vs existing pages. We will need to create new versions of all these messages, as the non-ellipsis versions will still be required the save dialog itself, and the old editor. The above patches just create new messages, which should be merged before any changes to use the messages, to give translators time to create translations. This should probably go in Tech News. Nirzar reopened this task as Open. this user facing change did not go through design. can we make sure to add design tag and ping someone from design? It did. The issue was discussed in T44138, and both Jan Dittrich and Pau Giner gave input about this solution; see T44138#3162853, T44138#3172023, T44138#3578131, T44138#3584006, and others. This task was specifically for implementation.